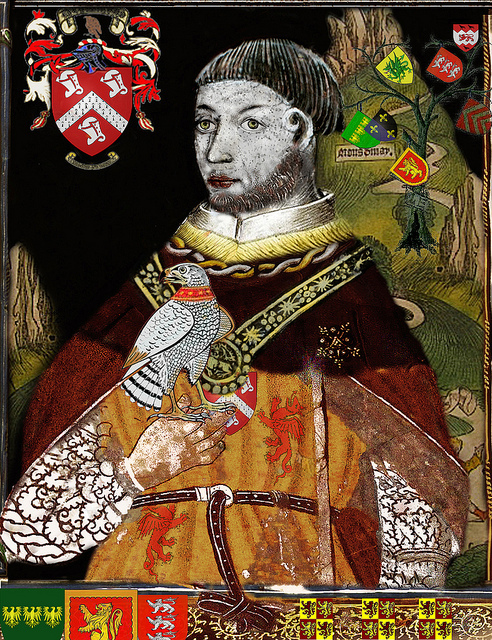 Owen Tudor was born c. 1400. His father was Maredudd ap Tudur ap Goronwy and his mother was Margaret, daughter of Dafydd Fychan. Through his father, Owen was a descendant of Ednyfed Fychan who was a major landowner in the area of Penmynydd in Anglesey. Fychan had been a prominent servant of the princes of Gwyndedd. Through marriage, Owen was a cousin of Owain Glyn Dŵr, the Welsh prince who rebelled against the kings of England. The Tudors were a part of a movement by the princes of Wales to unify the country into its own principality. Little is known of Owen’s early life but his family played a key role in the Welsh uprising and fought on Glyn Dŵr’s side. After the rebellion was suppressed, many Welshmen came into the service of the English kings, including Owen’s relatives. Most likely this is how he made his way to the English court and met the dowager Queen Catherine of Valois, widow of King Henry V.
Henry V died in August of 1422. Catherine was not allowed any political role in the government of her infant son King Henry VI. She was mainly the king’s caretaker and remained in his household until 1430. During this time, Catherine apparently began a liaison with Edmund Beaufort, Count of Mortain and future Duke of Somerset. This match caused great concern to Henry VI’s guardian, his uncle Humphrey Duke of Gloucester and the Regency council. There may or may not have been a Parliamentary statute passed at this point forbidding a dowager queen to marry without royal consent and forfeiture of lands. If there was a statute, it has disappeared from the parliamentary records. 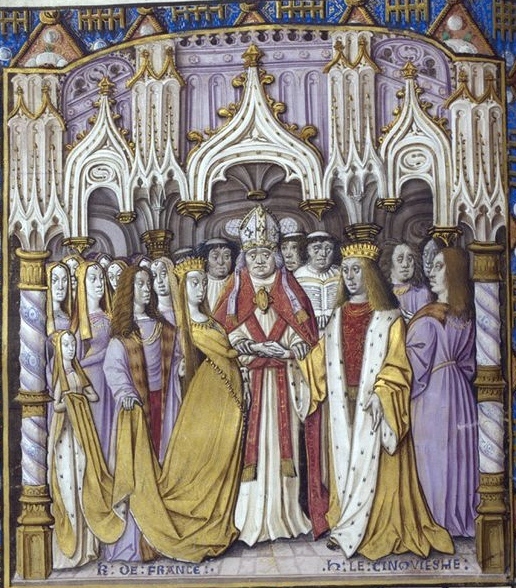 Whether or not this statute existed, the marriage of Catherine to Beaufort never occurred. Sometime between the years of 1428 and 1432, Catherine formed a romantic attachment with Owen. Many legends have flourished from their relationship but in actuality, how they met is a mystery. Evidence that Owen served in the Hundred Years War in France does not exist. There is also no evidence Owen actually worked in Catherine’s household. When and where they married is unknown. King Henry VII’s biographer S.B. Chrimes says they were canonically married by a priest but no date is given and there is no tangible documentation of the marriage. However, contemporary evidence suggests their marriage was valid and their children were recognized as legitimate. Chrimes says there was no Parliamentary statute forbidding the marriage. A statute did exist barring marriage between a person from Wales and a person from England, but Catherine was not from England so this didn’t apply in their case. There is a sixteenth century chronicle stating Catherine presented Owen’s pedigree to Parliament in 1431. At that time, he called himself Owen ap Meredith or Owen ap Meredith ap Tidor. The marriage was not exactly a secret but it was not widely known probably due to the disparity of their social status. Their relationship was acknowledged in 1432 and in May of that year, Owen was given the status and rights of an Englishman. In March of 1434, Catherine granted Owen favors from some of her lands in Flintshire. The couple must have traveled between different places as indicated by the birth of their children. Edmund was born c. 1430 at Much Hadham Place in Hertfordshire where Catherine owned some estates. Jasper was born c. 1431 at the Bishop of Ely’s manor at Hatfield. Catherine may have given birth to a son who was born in Westminster Abbey and stayed there to become a monk but this is disputed. A daughter is mentioned by the Tudor historian Polydore Vergil. Little is known of her. She may have died young or became a nun. Edmund and Jasper would later become loyal supporters of the house of Lancaster along with their father. Edmund’s son by Margaret Beaufort, Henry, would found the Tudor dynasty of kings. In 1436, Catherine was very ill and retired to Bermondsey Abbey to receive medical attention. She died on January 3, 1437. She never mentioned Owen or their children in her will, designating her son King Henry VI as her executor. Owen and Catherine’s sons Edmund and Jasper were sent to the Abbess of Barking to be brought up and educated. Once Catherine had retired to Bermondsey, Owen’s tribulations with the king’s Regency council began. The Duke of Gloucester called Owen to appear before the council but Owen was reasonably suspicious and requested a safe conduct. He received the safe conduct but his better judgement forced him to seek sanctuary in Westminster Abbey where he remained for some time. He finally appeared before the council to defend himself and maintained his innocence against any alleged charges against him. He was cleared and allowed to return to Wales. Despite his safe conduct, he was captured by Lord Beaumont and was given into the charge of the Earl of Suffolk at Wallingford. None of this persecution was due to his step-son the King. It is unclear if he was being charged with the crime of marrying the dowager queen without the king’s permission, it was related to another litigious matter, if he committed some unnamed crime or if Gloucester was just interested in punishing him. All of his goods, which were worth just over £137 were seized and he was imprisoned in Newgate. In early January or February 1438 he managed to escape with the help of his priest and a servant. He was recaptured and returned to Newgate and then transferred to Windsor Castle in July and put under the guardianship of Edmund Beaufort. He was held until July of 1439 when he was released on a £2000 recognizance. He received a pardon for all offenses in November, he became a member of the king’s household and Henry settled an annuity of £40 on Owen. From this point on, Owen served the king in various capacities. In December of 1459, the king raised his annuity to £100 and he was granted the office of Keeper of the King’s Parks in sections of Denbighshire which came with the customary wages, fees and profits. Owen was now truly a squire and began to be known as Owen Tudor. In 1452, his sons Edmund and Jasper were elevated to peerages and recognized as the king’s uterine brothers. Owen and his sons became loyal supporters of the house of Lancaster during the conflict later known as the Wars of the Roses. When Edmund was sent to south Wales in 1455 as the king’s representative, Owen may have accompanied him. Edmund died in November of the next year and Owen joined his other son Jasper. In 1459, Jasper and Owen were sent to arrest a servant of the known Yorkist John Dwnn of Kidwelly. Later in 1459, Owen obtained an interest in the forfeited estates of the Yorkist, John, Lord Clinton. Owen and Jasper were granted for life all the offices in the Duke of York’s lordship of Denbigh as a prelude to seizing the lordship. In 1459, Owen had a son born at Pembroke Castle by an unknown mistress. Jasper and the Earl of Wiltshire raised an army in Wales in January 1461 to fight the Yorkists on behalf of his half-brother King Henry VI. Owen joined the army which engaged the Yorkist troops of Edward, Earl of March in battle at Mortimer’s Cross on February 2, 1461. It was a victory for the Yorkists. Jasper and Wiltshire escaped but Owen was chased by the victors and captured. Upon the orders of the Earl of March, Owen was beheaded at Hereford. Before his execution, he suddenly realized he was going to die, believing he would be spared and placed in prison. He supposedly murmured ‘that head shall lie on the stock that was wont to lie on Queen Katherine’s lap’. His head was placed either on the market cross or on the highest step. A chronicler witnessed a mad woman comb his hair and wash the blood off his face. She then lit one hundred candles around the cross. He was buried in the chapel on the north side of Greyfriars Church, Hereford. There was no marker on the grave until his natural born son David paid for a tomb before the friary was dissolved. Owen’s life was celebrated by several Welsh poets who wrote eulogies in his honor. Further reading: “Henry VII” by S.B. Chrimes, “The Making of the Tudor Dynasty” by Ralph A. Griffiths and Roger S. Thomas, “The Historical Collections of a Citizen of London in the Fifteenth Century” edited by James Gairdner, entry in the Oxford Dictionary of National Biography on Owen Tudor written by R.A. Griffiths, entry in the 1899 Oxford Dictionary of National Biography on Owen Tudor written by W.A.J.A. Hello, thank you so much for this wonderful website! I see portraits of medieval figures in the style of this one of Owain Tudor, but never find a source. Do you know where these portraits come from? You know Lisa, I’ve been wondering the same thing. I’ve done a search and cannot find the source of these portraits either. I am a descendant of Maurice Wynne and the Williams Wynn family of Gwydir. My ancestral step-great grandmother was Catherine Tudor of Berain, a descendant paternally from Sir Owen Tudor and also again from Henry Tudor, first Welsh King of England and Earl of Richmond. The Wynnes were already cousins to the Tudors from the House of Aberfraw. May I make a copy of this? I will keep it to myself. I wish to thank you. Many family past interests my greatly.